Pikes Peak, Colorado/America’s Ultimate Challenge. It was beautiful! Tough one though. Athens, The Original marathon because of the whole history behind it. A good mix of 80’s, pop, and some good Salsa and Merengue too!! Only those who will risk going too far will ever know how far one can go. -Keep having fun while running! 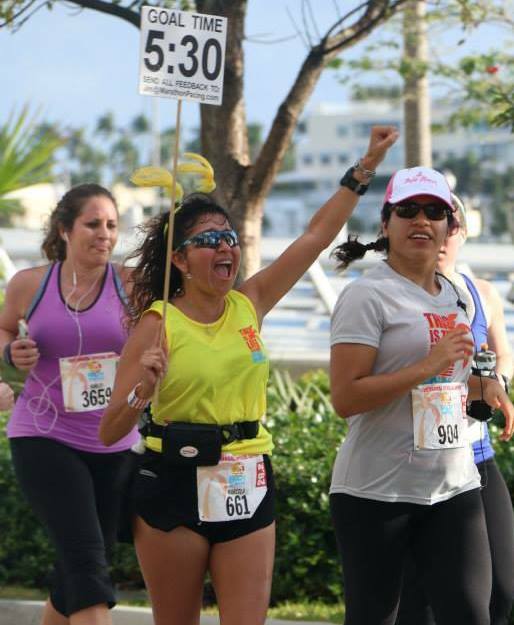 -Introduce people to the sport and motivate them to enhance their quality of life by running! -Run 50 marathons and a few more Ultras. Because it’s fun! I love the runners high! I meet wonderful people, and I love the sport. Pikes Peak Marathon. Getting to the top of Pikes Peak smiling. It was so challenging! Yet beautiful and breath taking! Literally! It was over 14,000 feet altitude. And then of course, getting to the finish line with an hour to spare. Whew! It was a great feeling of accomplishment. I love helping and motivating people to reach their running goals, specially the marathon beginners and first timers who are usually the ones I have in my 5:30 group. I love it! They all have a story to tell about why they are doing what they are doing, and helping them get to that marathon finish line and reach their goal is just such a wonderful experience! What a cool feeling! It is Priceless! Being a pacer requires experience and most of all, a heart to help people. I like to share with others my experiences, and with them, help them get trough the race. People thank you at the end, and we all have such a good time! It’s really fun! Palm Beach Marathon a couple of years ago. I had a 72 year old man running his very first marathon! I helped him through it and it was such a rewarding experience! He was inspired by my and I was so inspired by him! It’s never too late for one to start running! Marathon day is celebration day! It is the day when you celebrate your hard work, your training and commitment, and if you do it smart by not starting out too fast, but staying with us, you will have the time of your life! Marathon running and pacing has become such a big part in my life. I really enjoy helping others achieve their goals and feel motivated. I have also met wonderful people, not only the ones I have paced, but also other pacers who have become great friends and have motivated me to achieve new goals! We are all in these together and help each other. Pacers ROCK!! Life is good, God is good! And we are here for you!